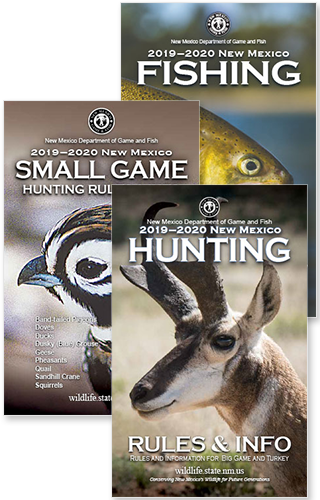 Click the tab headings below to learn more (and download forms) for special discounts (military, seniors, and disability) as well as certain exceptions to Hunting License Requirements & Fees referenced by the 2019-20 New Mexico Hunting Rules and Info booklet (pages 10-15). See also Hunting License Requirements & Fees. A reduced-fee Game-hunting & Fishing License is available to New Mexico residents with a permanent disability in accord with the Americans with Disabilities Act. Applicants must have one or more disabilities that substantially limit major life activities. Resident Handicapped License holders must purchase and possess a Habitat Stamp and Habitat Management & Access Validation (NM Hunting Rules & Info page 9) as applicable. All other laws and rules must be followed. For further information telephone: 1-888-248-6866 or e-mail: specialhunts@state.nm.us. The MI Certification form is available online or may be requested by telephone. This form must be signed by the applicant’s physician and attest that one or more of the above mobility-impaired conditions apply. Have one assistant to help track and kill big game that has been clearly wounded by the MI hunter. The assistant must have written authorization from the MI hunter and must use the same sporting-arm type as the MI hunter. Use a crossbow during a bow hunt. The MI card is valid for 48 months from the date approved/issued by NMDGF. The MI card holder must purchase and possess a Habitat Stamp and Habitat Management & Access Validation (page 9) if applicable. All other laws and rules must be followed. If you have suffered an injury or illness that may hamper your ability to hunt, reasonable accommodations for the specific dates of your hunt may be provided on a case by case basis. Please call 1-888-248-6866 for further information. Reduced-fee licenses for resident Junior Game-hunting & Fishing, Junior Deer, Junior Elk and Junior Game-hunting (resident and nonresident) are available to individuals 17 years of age and younger at the time of purchase. Junior licenses for hunting deer and/or elk on private land may be purchased at license vendors, NMDGF offices, by telephone or online. To qualify for youth-only hunts, applicants must be 17 years of age or younger on opening day of the hunt and must possess a Hunter Education number or Mentored-Youth Hunter number (pages 17, 18). The Mentored-Youth number is valid only for deer, turkey, javelina and small game hunts. Reduced-fee licenses for Senior Game-hunting and Fishing, Senior Elk or Senior Deer are available to residents 65 years or older at the time of purchase. Senior licenses for hunting deer and/or elk on private land can be purchased at NMDGF offices and license vendors, by telephone or online. Before purchasing a Game-hunting License, all hunters 17 years of age and younger must obtain a Hunter Education number issued by New Mexico or another state or possess a New Mexico Mentored-Youth Hunter number. The Hunter Education number is valid for hunting all game species. The Mentored-Youth Hunter number is valid only for deer, turkey, javelina and small-game hunting (page 18). For more, see also the Hunter Education webpage. The New Mexico Department of Game and Fish acknowledges the contribution and sacrifice of active military and veterans with several discounted licenses and special hunting opportunities. Information about active military and veteran hunting and fishing opportunities and how to apply is available online and by telephone. 50% discounts on all licenses, permits and stamps are available to New Mexico residents who are active duty military or veterans. The discount may be claimed by applying for or purchasing any license, permit or stamp online, by telephone or at any license vendor. Residents claiming this discount must be able to provide proof of active duty military (page 135) or veteran status (page 139) upon request. Discount does not apply to: application fees, license vendor fees, administrative fees (i.e. Landowner authorization certificate fee), duplicate license fees, the federal Duck Stamp, or the Resident Disabled Veteran Game-hunting & Fishing License. Active Duty Military (N.M. Resident): Current active duty in the Army, Navy, Air Force, Marine Corps or Coast Guard for a minimum period of 90 days. Members of the National Guard or Military Reserve Component and commissioned officers of the U.S. Public Health Service or National Oceanic and Atmospheric Administration who have completed a minimum of six years of continuous honorable service. Veteran (N.M. Resident): Nw Mexico resident veteran with a minimum of 90 days active duty service in the U.S. Military, or six continuous years in the National Guard, Military Reserve Component, or U.S. Public Health Service or National Oceanic and Atmospheric Administration. Veterans must have been honorably discharged from military service. U. S. Military (N.M. Resident): Army, Navy, Marine Corps, Air Force, Coast Guard, or their Reserve Components, Army National Guard, Air National Guard, and commissioned members of the U.S. Public Health Service and the National Oceanic and Atmospheric Administration. New Mexico residents who are 100% disabled as a result of having served in the armed services are eligible for a free lifetime Game-hunting & Fishing License. The disabled veteran must apply for a Disabled Veteran card. This card is issued by the New Mexico Department of Game and Fish and allows the cardholder to fish, hunt small game and obtain a Deer Hunting License free of charge. The Deer Hunting License will be issued only if the cardholder has applied and been successful in a public-land deer draw or if the cardholder can obtain written permission from a landowner for a private-land deer hunt. The free Deer Hunting License must be applied for each license year, and no preference is given for public-land deer draws. Stamps are required for any privilege not covered by the Disabled Veteran card. New Mexico residents who are disabled veterans of the armed services, but do not meet the 100% disabled qualification, are eligible for a $10 combination Game-hunting & Fishing License. Disabled veterans may purchase this license online, by telephone or at license vendors. A Habitat Management & Access Validation and Habitat Stamp if applicable (page 9) are required. New Mexico residents who are members of the National Guard or the U.S. Armed Forces and were called to active duty on or after April 3, 2003, are eligible for a free Game-hunting & Fishing License for the year following their deactivation and return to New Mexico. Proof of service must be presented to NMDGF. A Habitat Management & Access Validation and Habitat Stamp are not required in conjunction with this license. This is an once-in-a-lifetime benefit. Active-duty military personnel stationed at Fort Bliss in El Paso, Texas are eligible for resident fees on draw hunt licenses only for hunts that occur on portions of the Fort Bliss military reservation in New Mexico. Each year, proof of assignment must be submitted by email: specialhunts@state.nm.us, fax: 505-476-8180 or mail before the application deadline (NM Hunting Rules & Info pg. 6). Nonresident active-duty members or veterans of the U.S. Armed Forces who are undergoing a rehabilitation program that involves hunting activities are eligible for a resident fee on deer, elk, javelina, oryx, pronghorn and turkey licenses. The rehabilitation program must be sponsored by the federal government, or a nonprofit organization authorized by the federal government and it must be under the direction of a military or federal Veteran’s Administration rehabilitation center. This benefit is not available through the draw. Proof of eligibility must be provided. This benefit is available only through the NMDGF Santa Fe office.